The job market is changing. On this week's show, we explore how some Appalachians are adapting to new jobs, and how some traditional jobs are evolving. Although the coal industry has experienced a modest uptick in production since last fall, economists still predict a steady downfall for coal employment in Appalachia over the next few decades. As a way to transition to steadier work in technology fields, some coal miners are learning to become code workers. Coal miners are finding they already have some of the skills needed to learn robotics and even computer programming. Erica Peterson of WFPL reports. Meet 37-year-old Crystal Snyder, who, among other jobs, has one of the the oldest jobs there is … being a mother. Crystal is a single mother of two, who says she wants to stay in Appalachia, where her family has lived for hundreds of years. It’s been a challenge to pay all her bills, and find employment that she enjoys, all while being a single mom. Aside from financial stress, Crystal sometimes asks herself whether raising two kids in West Virginia is good for their health. Roxy Todd has the first story that helps explain Crystal’s Struggle to Stay. Despite the Trump administration’s support for the coal industry, the power sector is moving toward more use of natural gas. The switch is also happening in central Appalachia, where coal has long been king, with big implications for the region’s economy and environment. Glynis Board reports on two facilities that illustrate the power struggle that’s taking place in midst of the energy switch. Next, we travel to Virginia, where a non-profit called Plugged in Virginia helps prepare adult learners for high tech factory jobs. After-all, nowadays in factories people don’t really make stuff, machines do. But again, somebody has to know how to operate those machines. The program teaches students at community colleges across Virginia. On this show, Marci Gale, who teaches with the Plugged in Virginia Program at Central Virginia Community College speaks with Sarah McConnel, host of With Good Reason about why getting an education past high school is increasingly important...even for manufacturing jobs. When President Donald Trump signed an executive order back in March to roll back Obama-era environmental rules, he surrounded himself with coal miners and returned to a familiar campaign theme: “job-killing” regulations. But in some corners of coal country, an environmental regulation is creating jobs. 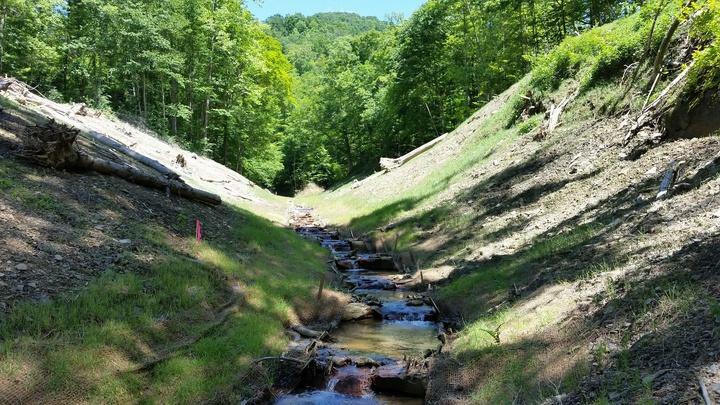 Stream restoration is part of a multi-billion dollar business, and some displaced miners are tapping into that revenue stream. Glynis Board reports. Here in Appalachia, is the economy really as grim as people say? Have you switched careers or gone back to school? Have you found living in Appalachia to be a struggle, financially? What have you found to help make ends meet? We’d love to hear your story. Send us a tweet to @InAppalachia or email feedback@wvpublic.org. We had help producing this episode of Inside Appalachia from WFPL in Louisville Kentucky, The Virginia Foundation for the Humanities, the Southern Foodways Alliance, and the Ohio Valley Resource. Music on this show show was provided by Marisa Anderson, Dinosaur Burps, Andy James Reams and the Barnstormers, Dog and Gun, and Ben Townsend. The fiddle music is from the archived field recordings at the Augusta Heritage Center. Inside Appalachia is produced by Jessica Lilly and Roxy Todd. Our executive producer is Jesse Wright, who also edited this show. Our audio mixer is Patrick Stephens. Claire Hemme helped with our digital correspondence. This week we meet the next person we’ll be following in our Struggle to Stay series. 37-year-old Crystal Snyder is a single mother of two, who says she wants to stay in West Virginia, where her family has lived for several generations. But being a single mom in West Virginia is challenging for her, and sometimes she worries whether raising two kids in this state is good for their health.